Help wildlife by providing additional features such as bird and bat boxes, solitary bee nests and bird feeders. Birds can be provided with food, either bought seed or food scraps, throughout the year. 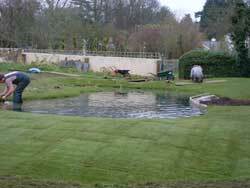 In November 2008 further to a Google search we were called to Heronsgate near Rickmansworth in order to consider and cost the construction of a wildlife pond. 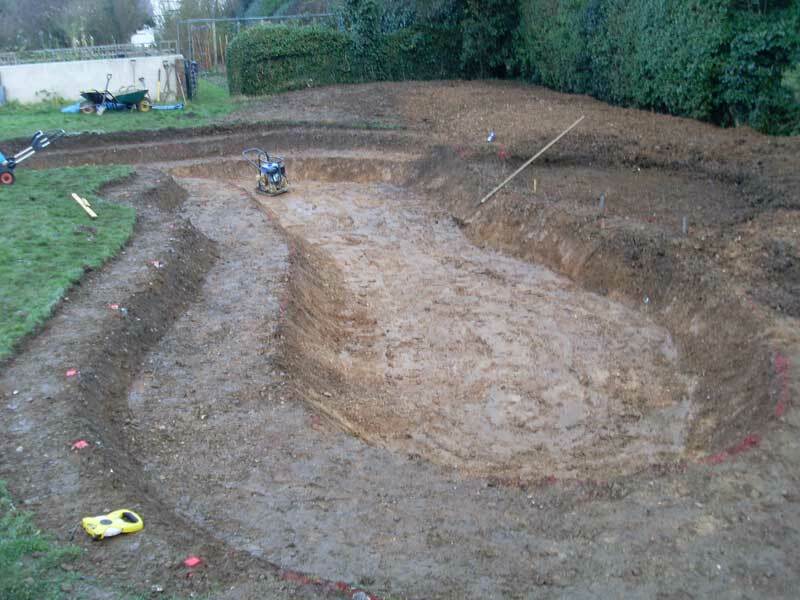 Our clients had been thorough in their preparation; they had the position, size and approximate shape of their proposed pond worked out. It was to be situated in a meadow to the rear of their property. The two acre site had been left to grass and the owners felt a feature was required. They had always wanted a wildlife pond. Within an initial consultation, we surveyed the proposed area and discussed at length what we wanted to achieve from the project. This gave us enough information to go away and come up with a proposal that would include a plan, schedule of works and estimate of cost. The pond was to be 15 metres at the longest point, 7.3 metres at the widest point and to depth of no more than 0.6 metre. 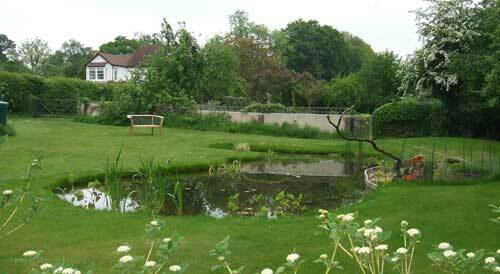 And when full the pond would accommodate some 6200 gallons of water. There are to be no fish, planting was to be indigenous, a boggy area was to be incorporated within the rear area and we need to attract and accommodate all manner of wildlife. The lawn was to run to the ponds edge, some spoil was to be redistributed around the pond and some to be taken to the bottom of the meadow. Work commenced in December and we were incredibly fortunate with the weather whilst the project was undertaken. 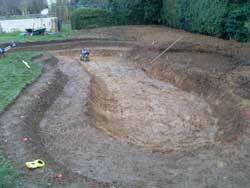 Within the two weeks it took to create the pond it was certainly cold, but dry. To appreciate what I mean within the accompanying storyboard there is a wintry photograph of the pond, this was taken only a week after completion! The pond plants were added in April and the latest photographs were taken in June 2009, by which point lots of wildlife had either found their new home or at the very least a convenient spot to stop off for a drink. At a time when ponds and wetlands are one of the fastest disappearing habitats in the UK, many species of wildlife are struggling to thrive. A wildlife pond will not only provides a beautiful and evolving picture, but will help to re-establish places for our freshwater wildlife to continue to exist. For more information, please call us or contact us.